Fairy gardens are a fun way to mix toys with nature. It’s also a great way for kids to spend more time outside. 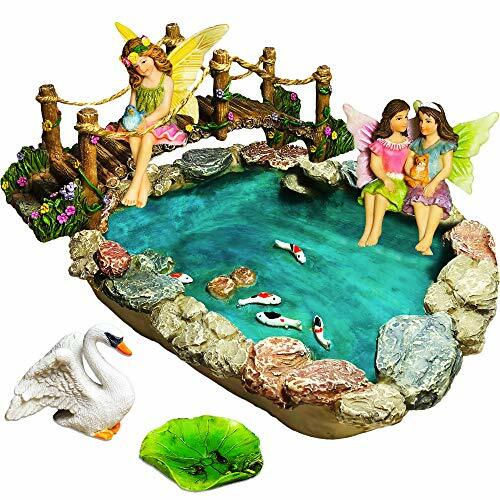 As you’ll see in our collection of fun fairy garden photos below, the sky is the limit when it comes to ideas and just how expansive you can create these gardens. Each year, our family visits a local Scandinavian Center where they do a full Midsummer’s celebration. The festival includes a large walk-through fairy garden that our kids love to visit and rearrange the fairies, gnomes, other figurines, houses etc. If you’re looking for a fun way spruce up your gardens and want to get your kids into gardening (or just get them outside), check out these ideas below. 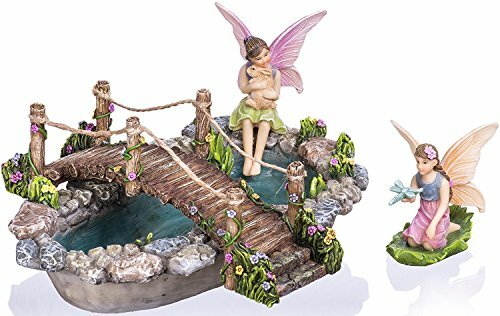 Incredible fairy garden in a series of three large flower pots all connected with miniature log bridges set in garden. 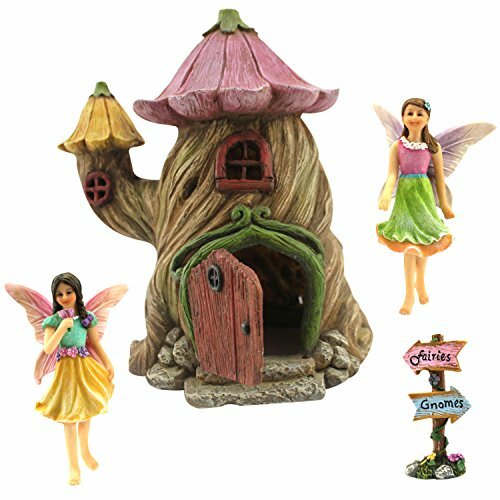 Flower pot with detailed fairy garden that includes a small fairy house, walkway decorated with flowers. Close-up of fairy garden in a large planter pot. Includes mushroom, deer, flowers and mini log bridge to adjacent fairy garden pots. 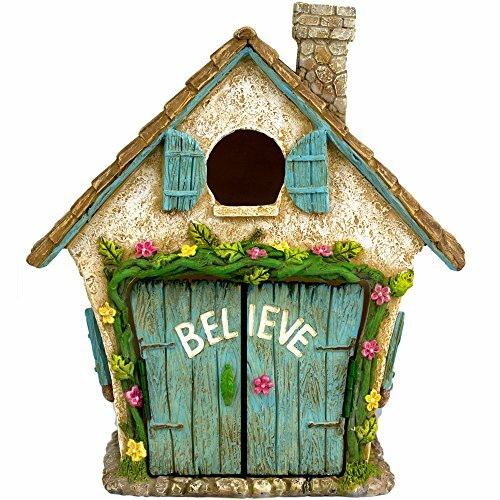 Fabulous stump fairy house with windows, shutters, front door and porch, flowers, creek with bridge and colorful walkway. Two decorative miniature figures in small garden. Spectacular wood fairy house and decorations built into garden. Fairy house, bridge and furniture built into stump. Fantasy mushroom house in the forest. 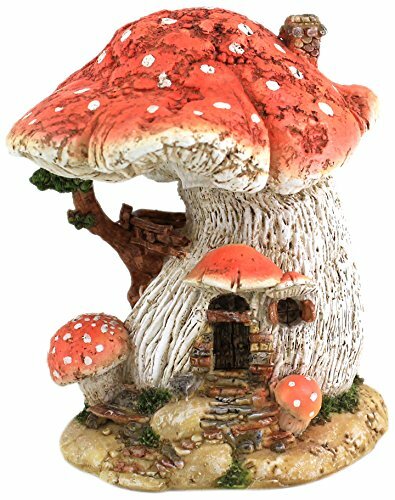 I love this fun fairy house. 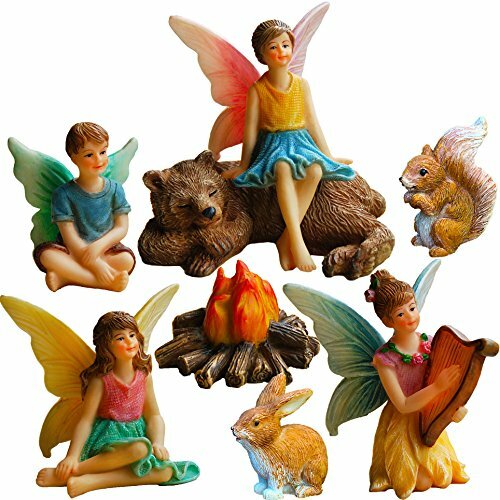 It would make a great collection to any fairy garden. A fairy garden in the woods with playground, houses, ladders – an entire fairy village. Miniature container garden pot with small trees, gnome and miniature deer. A fairy house made out of a broken planter with seashells. Closeup photo of a tiny decorative blue house built into a tree trunk. Garden gnomes decorating a garden and walkway. Snow White and Dwarfs in a garden with a house in and around a small creek. 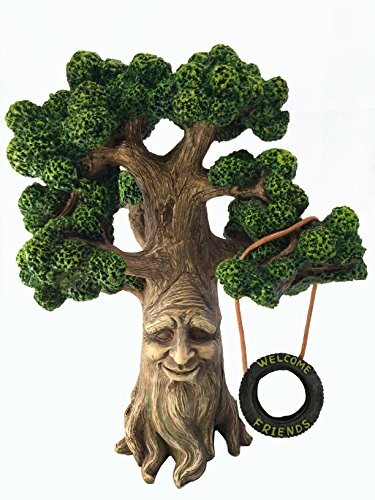 Gnome door in tree with front porch and stairs in the forest. Lovely miniature houses and flowers with picket fence in garden. Large fairy houses in the woods. 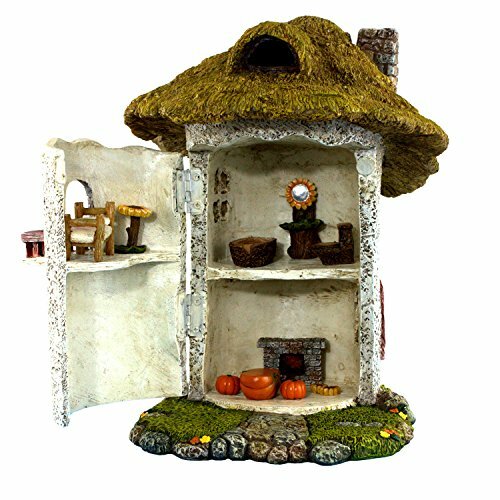 A spacious fairy house built with sticks and logs and includes pine cones for decoration. An open concept fairy house built with pebbles and shells. A fairy house or fairyhouse built into a tree stump and covered with green succulents. Elaborate vertical fairy garden in pottery mug placed on stump. A fairy house in a tree stump with a wood cut walkway, berries, little flowers and other decorative elements. This is a realy beauty. Tiny, purple fairy house in the woods. Close up photo of a fairy village with little windmill, house, pumpkin surrounded by plants and flowers. Fairy garden made with lots of sticks tied together. Cute fairy picnic scene with little stick fairy furniture, berries on a small stone patio surrounded by flowers. 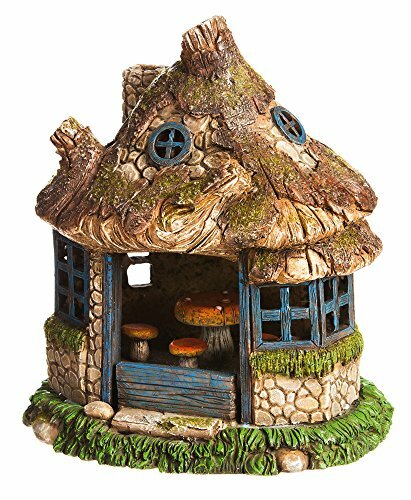 Detailed custom fairy house with mushroom structures. Includes full yard and lake with waterfall. Some decorative garden gnomes, in front of an old boat decorating a garden on the island Hiddensee. Yellow Fairy house along the path on the coast of Ireland. House is yellow with blue door, in a green lush forest. Blue Fairy house along the path on the coast of Ireland. House is blue with yellow door, in a green lush forest. Large fairy garden in and around a large log. 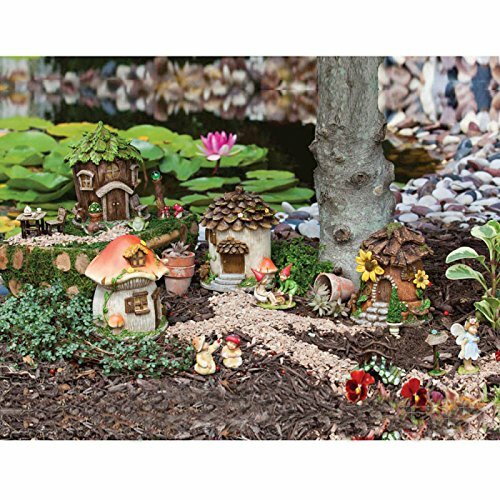 Includes several houses, pumpkins, mushrooms and many miniature garden gnomes. Fairy tea time with this miniature fairy tea table and chairs. Spectacular miniature log fairy houses built up on small stumps. Fairy house built into stump with front stoop, small birdhouse and miniature dog and snail. Very nice decorative garden scene. Old stump converted into fairy house with front steps, door and wood shingle roof along with wood shingles on gabled roof. 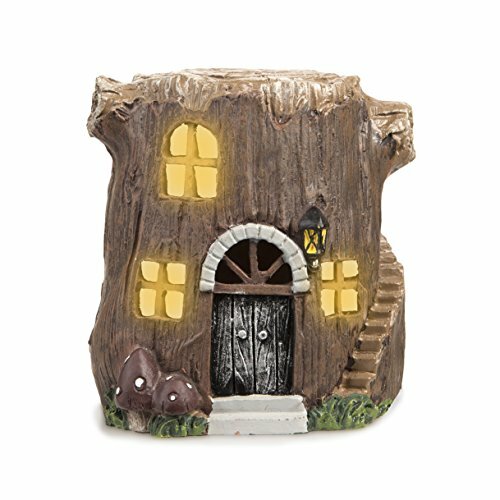 Log fairy house on small stump with a light. Small gnome garden with house in stump and garden gnomes placed around the base of the stump. Pottery jug fairy house in small garden. Close up of an entire fairy garden scene with thatched roof house built log-style with sticks, pebble walkway, miniature raised garden beds and small treees. Small fair chairs with fairies in small pebble garden. Fairy scene with house, bridge, chair and archways built in large steel bucket. Small decorative garden schene built in plate and includes white pot with miniature lambs, chicks, welcome sign and small flowers. 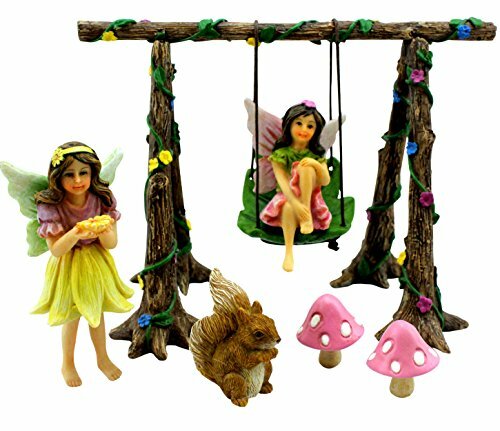 Fairy gardens are essentially weather-proof toys and toy scenes for the outdoors. They’re kind of like Play Mobil for the garden. 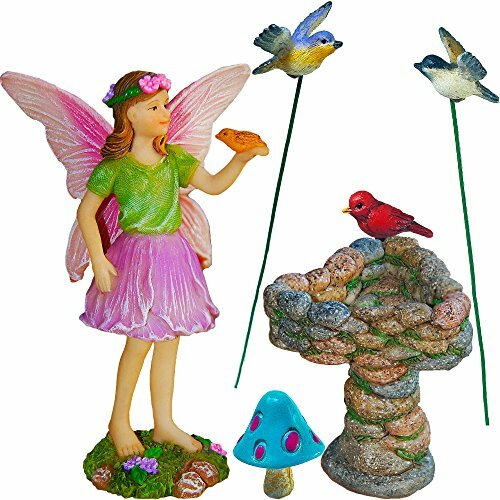 Here’s a laundry list of ideas, figurines and sets you can get to create a fairy garden. 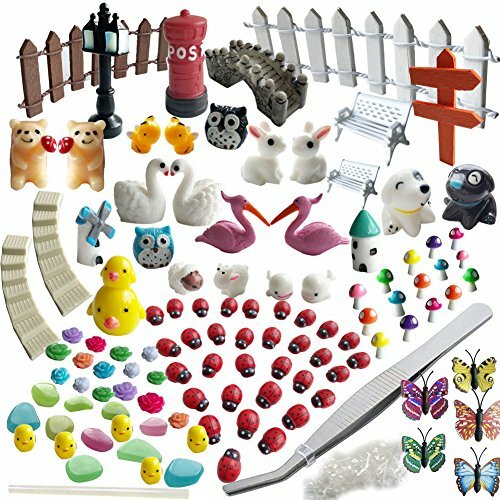 A quick way to create full fairy garden scene is to buy a set or kit. Here are some examples. 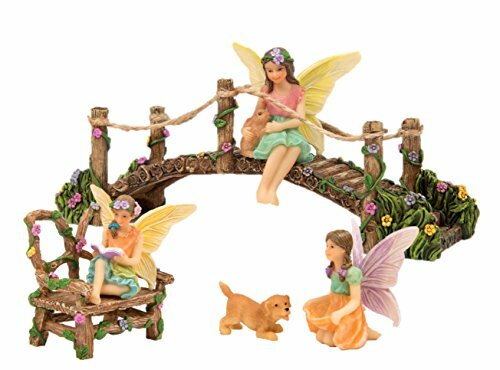 The final step in creating your fairy garden scene is to get some accessories and pieces such as fences, mushrooms, benches, trees, bridges and more. Here are some examples.